Purchased with the assistance of the V&A and the Friends of the Ashmolean Museum, 1983. This simply conceived but delightful study of a noble couple embracing by a stream or pool with lotuses was probably painted around the beginning of the 18th century by a Rajasthani artist working under strong Deccan influences. During the 17th century many of the Rajput princes spent long periods campaigning with the Mughal armies in the Deccan and in some cases acquired a taste for the local styles of painting. The picture is also of interest in that it has an unusually early English provenance (though not so early as the Indian album given by Archbishop Laud to the Bodelain Library in 1640). It bears marks showing that it belonged to three well known 18th century collectors of old master drawings, John Richardson senior (1665-1745), his son John Richardson junior and John Barnard (d.1784). 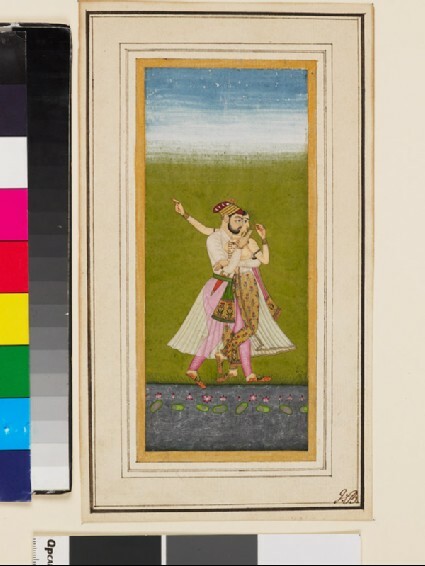 The elder Richardson, who was himself an artist is known to have owned a group of Rembrandt’s drawings based on Mughal paintings, as well as an album of Indian drawings.